John Campbell and his Campbell Live show has been campaiging strongly against the GCSB bill. This campaign shifted up a couple of gears last week with a daily does of a dual GCSB road road show, plus and interview with John Key on the GCSB on Wednesday. One of the things Campbell was trying to prove was that there was far more interest in the GCSB Bill than Key had been claiming (“more people are worried about snapper”). They only recovered on Friday when a GCSB road team happened to arrive in Seddon just after the earthquake and there was good coverage of that. This doesn’t tell us whether it was the topic or the way the topic was being covered that turned off viewers, but iCampbell’s hard out anti GCSB bill campaign was a rating flop. Tonight Campbell will have the results of the campaign poll, but this is so flawed it wil tell us nothing apart from how many people bothered to respond. We’ll see if Campbell turns to other topics for the rest of the week,or whther he is so personally involved in the GCSB campaign that trying to win on that is more important to him than ratings. 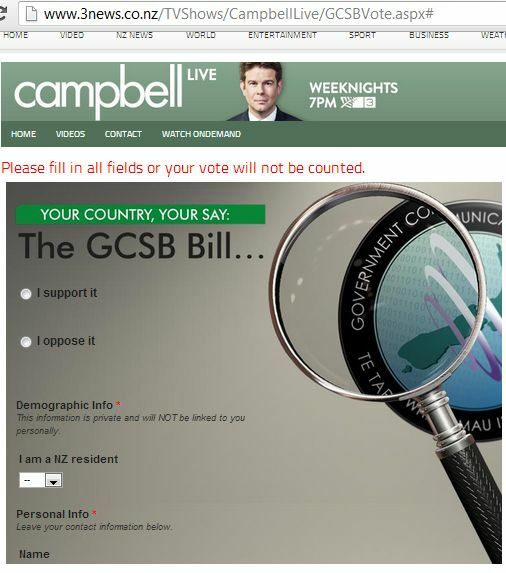 Campbell Live is running a poll on the GCSB bill which will run until the results are announced on Monday 19th August. 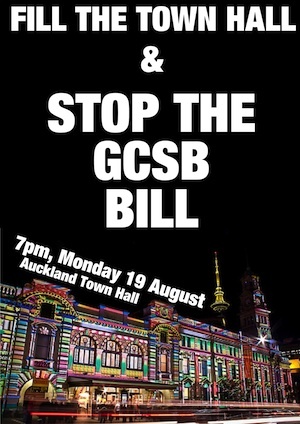 This coincides with a “Fill the Town Hall and Stop the GCSB Bill” campaign meeting in Auckland. Whale Oil has had a dig at the poll – Is the Campbell Live GCSB Poll a piss-take or what? Whale points out the irony of capturing of private data in a poll about the capturing of private data. In the next week we’re aiming for the biggest opinion poll in NZ history. Do you support the GCSB Bill? Vote here. Andrew explains what anyone familiar with polling will know. Here’s a really important point for anyone wanting to judge the accuracy of this poll –big numbers do not provide representative data! This poll commits the ultimate sin of survey research – it uses a self-selecting sample. People choose to take part based on the topic. This means that the poll only represents the New Zealanders who feel strongly enough about the GCSB bill to take part in the poll. The only way to attempt to gain a representative result is to take a random sample of New Zealanders, and to ask them the question. Preferably, the topic of the poll shouldn’t be given to people in advance, so their decision about whether to take part will not be based on the topic in question. He then shows how self-selection with polls can “make an enormous difference”. But it’s worse than simply self-selection. It takes a bit more effort but it’s still possible to vote multiple times in the poll. And there are active campaigns to distort the poll to try and achieve a particular outcome. There is a major effort to make the poll a PR device which is a distortion of democracy. Stop the GCSB Bill is promoting the poll on Facebook. And it is likely to be promoted elsewhere. Ironically a commenter ‘geoff’ at The Standard complains about the results being skewed by National. The results will be skewed for sure, but it will impossible to tell how much and in which direction the most skewing has occurred. And this is becoming common. And skewed results are being used in PR campaigns to try and create deceitful perceptions. It’s a common practice now to use a protest, a poll, a petition or stack submissions to create a perception of democratic opinion. This is deceitful democracy. Campbell Live should know better. Unless they do know what they are doing. Campbell Live is running a different sort of online poll, on the GCSB bill. Most media polls online are easily manipulated. They seem to be making an effort to minimise rigged voting in this one, as they are requesting Name, email address and address. This an improvement, but it doesn’t get around the problem of non-random sampling. Groups can organise voting to try and sway it their way – and they have already started to promote it in social media of a particular persuasion. But polls don’t usually care about things like that. My guess is that it will show a sizeable number of people opposed to the bill, but most people don’t care about the bill and won’t bother voting. Also unusual is the timeframe, the poll will be run over more than a week. Thank you for taking the time to have your say on the GCSB bill. Find out what the rest of the country thinks when the results are revealed on Campbell Live on Monday August 19th. That’s an interesting date. It might be a coincidence, but a a major protest meeting is organised for the same night. This is (not surprisingly) being promoted at The Daily Blog and also at The Standard – Fill the Hall – Kill the Bill. There are a significant number of people passionate about stopping the bill, and a lot more using it as a political opportunity to oppose the Government. But I still don’t know if the wider public care much or know much about this. The Law Society has campaigned strongly against the GCSB Bill. Yesterday the Society released a statement saying GCSB Bill remains flawed despite proposed changes. Proposed changes to the GCSB Bill represent minor improvements but do not address the fundamental flaws in the bill and the legislation should not proceed, the New Zealand Law Society says. Austin Forbes QC, convenor of the New Zealand Law Society’s Rule of Law Committee, says the Law Society has looked at the amendments proposed by the majority of the Intelligence and Security Committee, and has a number of concerns about the wording and scope of the changes. The concerns the Law Society expressed in its submission on the bill have not been significantly mitigated by the proposed changes. But some of the most significant changes have been proposed by Peter Dunne and the Prime Minister. Further changes by way of a proposed Supplementary Order Paper have been announced by the Prime Minister and the Hon Peter Dunne, but that SOP has only just been made publicly available. “The proposed use of the SOP procedure to make still further changes, but without making the detail of those changes available to the public, reflects the unnecessary urgency which has accompanied the GCSB Bill itself. The Law Society is also concerned about the use of the SOP procedure to introduce significant amendments to bills after completion of the select committee process. There’s a valid complaint about the SOP amendments not being made public in time to examine then thoroughly, they were only posted online about midday yesterday, and the bill was due for it’s committee debate later in the afternoon (delays put the start time back to 7.30 pm). But headlining GCSB Bill remains flawed despite proposed changes without giving consideration to all the proposed changes implies their mind is made up regardless of the amendments. And it should be noted that Peter Dunne’s amendments were publicly notified two weeks ago, the SOP was the legal version of something that was already known. It would have been better for the SOP to have been available sooner, but what Dunne was proposing was well signalled. In a speech during the debate last night Attorney General Chris Finlayson criticised how the Law Society had handled their input. I am sorry but the New Zealand Law Society is wrong—the Law Society is wrong. What is more, more than a few members of the profession—more than a few members—have expressed their concerns to me about the way their submissions were given, by someone who then went to the Mount Albert Memorial Hall and was making all sorts of extravagant comments—someone who used to act for Mr Zaoui—and at the same time was purporting to represent the Law Society. The thing about the Law Society, to quote a former United States judge, is that it is the bar that makes the statutes, and it is a very important function the Law Society fulfils, to come down to this place to give Governments of all persuasion a good swift kick from time to time, but do so in an impartial and professional way. Regrettably, the standards were not applied in the case of the submissions on this legislation. There will be more about that later. If ‘later’ means during further debate speeches we may have to wait until next week to hear more on this. We may also hear more from the Law Society. Chris was born in Wellington in 1956 and attended Victoria University, graduating with a Bachelor of Arts in French and Latin and a Masters of Law. He practised law in Wellington for 25 years, where he was a partner at Bell Gully from 1990 – 2002 and thereafter a barrister sole. Concerns have been expressed that the GCSB advisory (oversight) panel, as well as the Inspector General, will be appointed by the Prime Minister, meaning he will have control over all people involved in the warrant issuing and oversight process. This isn’t supported by the facts. (1) The Director of the Bureau is appointed by the Governor-General, on the recommendation of the Prime Minister, for a term not exceeding 5 years, and may from time to time be reappointed. “(b) must provide advice on the nominations for Director to the Prime Minister. So that process involves the Governor General, the State Services Commissioner and the Prime Minister. We recommend amending the bill (inserting new sections 15A, 15B, 15C, and 15D (new clause 33A)) to establish an advisory panel to provide advice to the Inspector-General. The bill aims to build on and further strengthen the oversight arrangements of New Zealand’s security and intelligence agencies. We believe the establishment of an advisory panel to provide advice to the Inspector-General would contribute significantly to strengthening the oversight arrangements. The amendments we propose also provide for the advisory panel to report to the Prime Minister on any matter relating to intelligence and security, if the panel considers it necessary to do so. We recommend in new section 15C that the panel consist of 2 members and the Inspector-General. Members would be appointed by the Governor-General on the recommendation of the Prime Minister after consulting the Intelligence and Security Committee. This section establishes an advisory panel. (1) The function of the advisory panel is to provide advice to the Inspector-General. (b) the Inspector-General may provide information to the advisory panel, whether in response to a request under paragraph (a) or on his or her own initiative. (4) The advisory panel may make a report to the Prime Minister on any matter relating to intelligence and security, if the advisory panel considers that the matter should be drawn to the attention of the Prime Minister. (2) The members and chairperson appointed under this subsection are appointed by the Governor-General on the recommendation of the Prime Minister after consulting the Intelligence and Security Committee. (3) One of the members appointed under subsection (2) must be a lawyer within the meaning of the Lawyers and Conveyancers Act 2006 who has held a practising certificate as a barrister or barrister and solicitor for not less than 7 years. (4) Both of the members appointed under subsection (2) must have an appropriate security clearance. (d) may be removed from office by notice in writing from the Prime Minister for misconduct, inability to perform the functions of office, or neglect of duty. This addresses two common criticisms. The Governor General and the Prime Minister are involved in the appointment of the panel, in consultation with the Intelligence and Security Committee. The committee currently comprises John Key, John Banks, David Shearer, Russel Norman and Tony Ryall (who recently replaced Peter Dunne). This provides cross-party oversight of the appointments. I don’t think an appointment would be made that is strongly objected to by any members of the committee. And at least one of the two members must be a lawyer. This further reduces the chances of any possibility of cronyism, which is the fear of some. The advisory panel substantially improves oversight of the processes and practices of the GCSB being used as an agent of the NZSIS, Police and Defence Force. Labour have submitted Supplementary Order Paper 305 seeking changes to the three related bills being amended. 25A. An independent inquiry to report back within 6 months of commencement of the bill. 27A The amendment to the Inspector-General of Intelligence and Security Act to expire 12 months after it receives the Royal assent. 37A The amendment to the Intelligence and Security Committee Act to expire 12 months after it receives the Royal assent. So basically they want an inquiry within 6 months and chuck out all the amendments in 12 months, presumably anticipating recommendations of the inquiry to be enacted by then. A Supplementary Order Paper detailing Peter Dunne’s amendments is not yet on the Parliament website. Labour opposes this Government Communications Security Bureau and Related Legislation Amendment Bill. We oppose it not because we do not accept that there are serious problems with our intelligence agencies, and not because we do not think that changes in law are not necessary, but because the Prime Minister, who is responsible for our intelligence agencies, has simply not made the case for why we need to ram through this legislation so quickly without taking a proper look at the critical issues right across our intelligence agencies—not just with the Government Communications Security Bureau (GCSB) but right across the intelligence network. I asked John Key whether he had any evidence that New Zealand would be more at risk if this legislation was not passed through, and he simply could not make that case. He also could not explain why, if changes are so urgent, he did not act a year ago when he found out the problems and put urgent legislation through then. This bill has been rushed and it has been poorly informed. The Prime Minister denied my request for the Intelligence and Security Committee to hear the SIS, the defence forces, and the police about how they were going to fit with the GCSB and why they needed the GCSB’s support as they had described. He turned that down, and he did so because he did not want to take a closer look at what the problems really are. He wants this off the political agenda, and that is the scenario we are looking at. He knows that people do not believe his explanations. New Zealanders do not believe his explanations. They are losing trust in his oversight, and they do not believe that he is passing the law for the right reasons. He wants the spying scandal to just go away, but it simply will not go away. The tragedy of this is that it is a missed opportunity for New Zealand. It is an opportunity we could have had to pass legislation that would restore Kiwis’ confidence in our intelligence agencies so that people know we are operating in their best interests and that we have got the balance right between security on the one hand and their privacy on the other. That is why Labour has argued we need a full and independent inquiry across our intelligence community before we put legislation in front of this House. New Zealanders’ confidence has been shattered by the recent events in our intelligence agency. It has been a complete train wreck. We have seen a litany of failures—the Government Communications Security Bureau (GCSB) illegally spying on Dotcom. And remember we would not be here putting this legislation through if it had not been for Dotcom and the fact that Bill English was trying to hide the illegal spying by the GCSB on Dotcom from the courts. That is a fact. We then found out there is illegal spying on many other New Zealanders. We then find out that John Key has shoulder-tapped a mate of his to become the head of the GCSB. Now we have heard in this past week that a New Zealand journalist was spied on and tracked in Afghanistan, and our agencies were complicit in that. Now we have got officials tapping into journalists’ phone records right here in our Parliament. The GCSB, of course, was involved in that too. The Henry report actually states that they had a “substantial role”, particularly in the gathering of records. But, of course, John Key says it is nothing to do with him—nothing to see here, nothing to be worried about. It is the Parliamentary Service’s problem. It is David Henry’s problem. It is somebody in the GCSB’s problem. It is the legal adviser’s problem. It is somebody who had a brain fade’s problem in the GCSB. Through all of these scandals John Key has been trying to pass the blame on to somebody else. When he does get caught out, we have to drag the truth out of him. Well, I say to Mr Key it is time to stop making excuses. A serious mistake has been made. Stop blaming others and start taking some responsibility for the actions of the agencies that you lead. Today was astonishing. Mr Key took the opportunity on breakfast radio to announce that there is the existence of al-Qaeda threats. This was, I believe, reprehensible. We have seen the pattern before: weapons of mass destruction. We have seen the Boston bombings brought into the debate around the GCSB bill. But in this case there is no context, there is no detail, and there is no ability for him to give context or detail. He is using his privileged position as the head of our spy agencies to give himself political gain. That is reprehensible. His scaremongering is designed to shift attention away from the facts of the case and the train wreck that is this bill and what is around it. But here is the second thing that I find so astonishing about the Prime Minister coming out and saying something like this: it is incredibly stupid. It is incredibly stupid. Why do you not send a postcard to people who are threatening us, saying: “We’re spying on you.” It is incredibly dumb. This is not “Boys’ Own”. This is serious. I have spent 7 years in the Middle East alongside people who have let off bombs, and my family was in a hotel where a bomb went off and killed 40 people. So does that make us feel safer—that somehow he could announce to everybody that these people are going to be spied on? Well, I think it is extraordinary. Apart from anything else, we actually have agencies, our intelligence agencies, working on it. Those intelligence agencies are actually doing a pretty good job. They do not need to have their activities dragged into the public arena for a man’s political gain in order to help them with their jobs. In fact, they have definitely just had their jobs hampered as a result of that. New Zealanders want to be able to trust our intelligence agencies again and to know that they are doing good work and they are properly policed, but that will not happen when all the power continues to rest in one person, unlike in any of the other countries that we are close to. The Prime Minister appoints our top spy and he heads up the committee that provides the oversight, so he is in charge of operations and he is also in charge of oversight. He chairs that committee. On top of that he has the casting vote. He appoints the inspector-general and the commissioner of warrants. Let us just go back again to where we started with this. It was about Dotcom. The only reason we got to hear about that was because Mr Dotcom revealed it in court. Otherwise, we would not have heard anything—we would not have heard anything. We are setting up a system designed for cover-ups. We are setting up a system that simply will not work. The real shame about this is that we could have had a much better system. That is the extent of the negotiations with this side—no phone calls, no approaches, no nothing. I will say right now that Labour will work with the Government on an independent inquiry with terms of reference that can be agreed right across Parliament, and that we will work with you to get good law that will provide the confidence that New Zealanders need in order for our intelligence agencies to function in the proper way. Thank you. I move, That the Government Communications Security Bureau and Related Legislation Amendment Bill be now read a second time. There has been a great deal of scrutiny and debate over this Government Communications Security Bureau and Related Legislation Amendment Bill. There has been a lot of uninformed commentary. There have been a number of examples of the great and the good, the well meaning but impressionable being misled by ill-founded fearmongering. So, at the outset, let me make it quite clear: this legislation is not a revolution in the way New Zealand conducts its intelligence operations and national security. It is not a case of expanding the borders of some intelligence empire. This is about fixing legislation that at its best is not fit for purpose and, at worst, is broken. Under this bill, New Zealanders can be confident that our intelligence agencies are acting in accordance with the rule of law. The bill sets out definitively what it is our intelligence agency can and cannot do under the law. There are no grey areas. There are no loopholes. This is very important because of the status of national security in a democratic society. National security is vital for maintaining the freedoms and the way of life that we hold dear. It is vital for keeping us safe and free from harm. But national security tools, if turned inwards and not subject to strict controls, can erode that way of life and threaten the freedom of individuals. National security legislation must not have loopholes that can be exploited by those who would threaten our security, who would threaten loss of life through terrorism or criminal activity. But, equally, national security legislation must not have grey areas of uncertainty or doubtful interpretation that allow the State gradually to extend its activities and creep into ordinary people’s private lives like some kind of growing shadow. The bill strikes the right balance. It makes amendments to three Acts, with the three main objectives being to clarify what the Government Communications Security Bureau (GCSB) can and cannot do, to update the legal framework in response to the changing security environment, and to strengthen the oversight of our intelligence agencies. Labour’s 2003 Government Communications Security Bureau Act sought to codify and make transparent existing practices of the then Government Communications Security Bureau. It failed. The Kitteridge report found that the 2003 legislation is not, and probably never was, fit for purpose. The bureau currently has three core functions: cyber-security and information assurance, foreign intelligence, and cooperation and assistance to other entities. Those three functions are retained under this legislation. For an organisation possessing the powers the GCSB does, an unclear legal framework is simply unacceptable, so the relationship between these three functions has been set out in much more explicit terms than in the existing legislation. Between 2003 and 2011 there were 88 instances of surveillance that highlighted difficulties of interpretation. There is a grey area in the current law, and it arises because of a lack of clarity over the legitimate activities of the GCSB of those three different functions. That grey area disappears under this legislation. On the matter of assistance and cooperation, Labour’s 2003 Act said that the GCSB could assist other public agencies in New Zealand in the performance of their functions and also to prevent and detect serious crime. It authorised explicitly the surveillance of foreign organisations and individuals to obtain foreign intelligence—organisations and individuals who in some cases may make contact with New Zealand citizens and residents. But the law also said, in apparent contradiction, that the GCSB must not intercept the communications of New Zealand citizens or permanent residents. In hindsight, this was a recipe for confusion. Parliament had intended something straightforward, that the GCSB should target foreign nationals only when gathering intelligence under its second function, and, in addition, the GCSB should also be available to assist agencies such as the police and the SIS in their legitimate and warranted domestic activities. But the wording was contradictory and unclear. The GCSB acted according to its internal advice, to fill this grey area. That advice was in keeping with the intention of those who passed the Government Communications Security Bureau Act in 2003, but it may or may not have been justified by the words of the statute itself. Ambiguous law that leads to secluded decision-making on a case by case basis is unsatisfactory, so we are taking these steps to overhaul the legislation and make it fit for its original purpose. The responsible thing for this Parliament to do is to clarify the Act to specify which agencies the GCSB may assist, and to what extent, and to remove ambiguity and increase oversight from outside the agency. The question of oversight is a very important one generally, not only in relation to the GCSB. Former GCSB head Sir Bruce Ferguson recently implied that he wished there had been greater oversight of orders he issued as head of the Defence Force, classifying some journalists as subversives. This week he acknowledged that he had never thought of journalists as the enemy, and expressed his disappointment that no one had since overturned the orders he could not remember making. It is a reminder that memory can fail us. Some commentators, including Sir Bruce, have opined that the questions around the GCSB represent something new about the way intelligence operates in this country. That is simply untrue. The problems of drafting and legislative interpretation date back to the passage of Helen Clark’s 2003 legislation. This bill is not revolutionary. It is not an aggressive expansion of State powers. Its purpose is to provide concrete rules that leave less room for uncertainty. This is evident from the treatment of metadata in the bill. There has been much talk of metadata recently. It has become something of a buzzword. Rt Hon Winston Peters: This is quite sad. This is quite sad. Hon CHRISTOPHER FINLAYSON: But there is no magic in metadata, I say to Mr Peters. In this bill, metadata is treated as any other communication. This bill authorises the interception of certain communications. Communication does not differentiate between data and metadata for the reason pointed out by a number of submitters: we do not have a clear definition of metadata. The type and number of ways in which data can be described and indexed—that is, the categories of metadata—are growing all the time. If we included a definition, then we would risk leaving loopholes as new technologies emerge or new business systems are developed. We do not want loopholes that expose New Zealanders to unnecessary risks because our legislation cannot keep up with technology. Nor do we want amorphous gaps in the legislation that could allow agencies to exceed the powers intended for them, by incrementally extending definitions by analogy. This bill takes into account national security and privacy. The issue is not national security or privacy; it is both. National security is about protecting our citizens and the rights and the freedoms we value. The legislation is sensitive to those rights and freedoms. In conclusion, the bill has been subject to extensive discussion and debate, which on occasion have obscured this very important issue. The bill before us today incorporates 19 recommendations endorsed by the Intelligence and Security Committee—and it is important to say that they reflect public submissions—and there will be further changes, which have been flagged publicly, in a Supplementary Order Paper. As I say, this bill does not represent an extension of powers but a clarification. I commend the bill to the House. In an interview on Q & A yesterday John Key said that the changes negotiated by Peter Dunne on the GCSB bill “dramatically changes this legislation”. JESSICA I want to talk about your specifics, though. What will Peter Dunne get in return for supporting this legislation? Has he asked for anything, and will you support him in Ohariu? JOHN Well, he hasn’t asked for other things outside of changes to the GCSB legislation. JESSICA So he’s doing this purely out of the goodness of his heart? JOHN No. I mean, he gets a lot out of this. I mean, he’s going to put up a Supplementary Order Paper that dramatically changes this legislation. And “we actually have a good working relationship with Peter Dunne, and, bluntly, we trust him, and we can work with him”. JESSICA Does he get anything outside of this legislation? Any promises? Or is it just goodwill between the two of you? JESSICA So will you have a cup of tea with him in Ohariu? JOHN Well, I wont rule that out. JESSICA But nothing formal. So that wasn’t part of this deal? JOHN Its not part of the deal at the moment, no, but we have a working relationship and continuing to have that working relationship, I think its a positive thing. This is in contrast to Key’s lack of a working relationship with Winston Peters and a failure by Peters to engage with Key on the GCSB Bill. JESSICA I want to move on to domestic issues and the GCSB. Are you prepared to compromise with Winston Peters to get him on board? JOHN I wouldn’t rule that out. What I’ve said is that there’ll be the SOP process, so a Supplementary Order Paper. So when the bill comes back to Parliament, it’ll have its second reading. Then what happens from there is the committee stage. At the committee stage, we already know a list of things that Peter Dunne will introduce. Now, in a theoretical world, if NZ First or any other political party – lets take NZ First – came along and said, We will support the legislation if you make these changes, and they were acceptable to the government, there is always that window of opportunity to make that change. But Peters increasingly seems to prefer to harrumph from the other side of a closed window. While Dunne manages to effectively get things done. Results matter in politics. In the case of the GCSB bill Dunne achieved the best improvements that he could – which, still, is far more than any other MP.